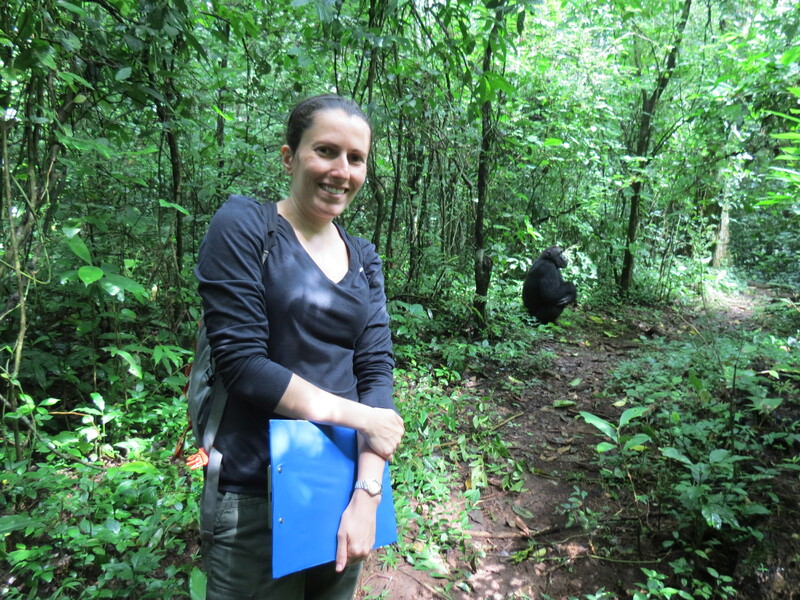 Conservation and Community Engangement Intern Alicia Moreau guest-blogs about Chimpanzee Action Awareness Week on Zoohoo! 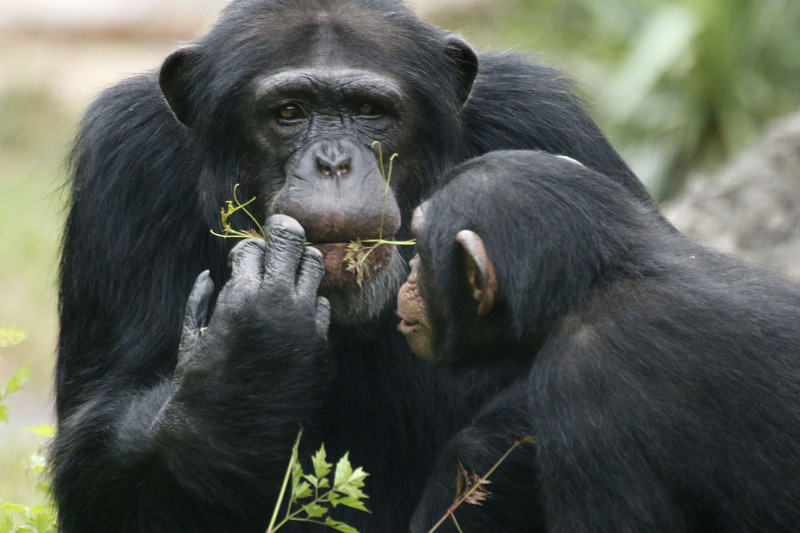 Chimpanzees are more closely related to humans than we may think. We share 98% of our DNA with chimpanzees and quite a few personality traits. In 1962, virtually nothing was known about chimps in the wild. Jane Goodall changed all that. She dedicated her life to researching and observing chimps by sharing a special bond with them — she says, “One touch started a revolution.” Goodall is the reason we know so much about chimps and the personalities they possess. They share our emotions of pleasure, joy, and sadness. Chimpanzees are very social animals and thrive in communities of about 15-20 consisting of both genders. However, they tend to feed, travel and sleep in a smaller community consisting of six or fewer. One may say that this is related to humans due to our nature of establishing close knit groups of friends and/or family we surround ourselves with on a regular basis. Chimps are also related to us in their ability to communicate through complex systems of vocalizations, gestures, body postures and facial expressions. 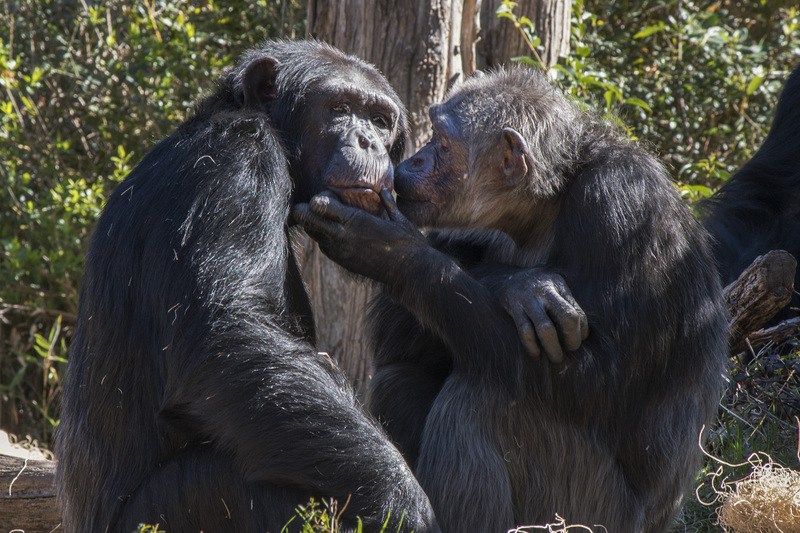 Grooming is an important example of their social nature. They participate in grooming for two main purposes: cleaning and establishing bonds between family and friends. It’s a critical action that helps them maintain friendships and comfort each other after a hard time or disagreement. 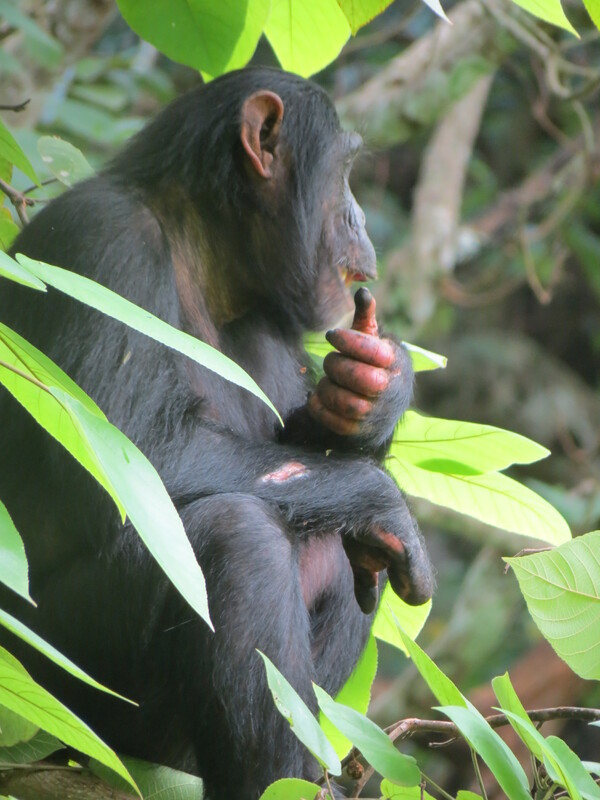 The use of tools was first observed by Goodall when she witnessed a chimp use the stem of a branch to collect termites for food. After this groundbreaking discovery, more evidence has been found all throughout Africa. Chimpanzees use rocks as hammers; anvils to open nuts; leaves as napkins or sponges; sticks to open beehives for honey and create spears to kill small mammals. Chimps are actually great apes and not monkeys. An easy way to distinguish between the two is to look for a tail. Monkeys have tails, while apes (gorillas, orangutans, bonobos, chimpanzees, and humans) do not. Chimpanzees are omnivores. Their diet consists mostly of fruit and leaves. However, they also tend to eat insects, bark, eggs, nuts and even smaller monkeys or other animals for meat. 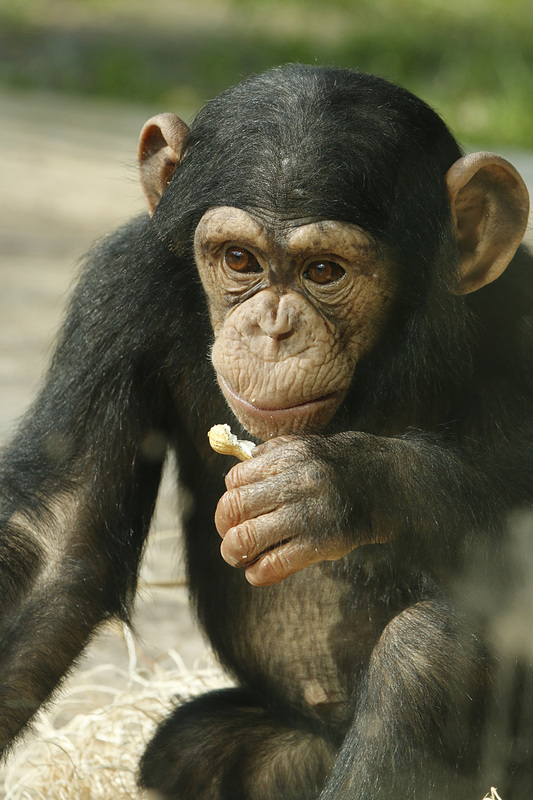 Chimps are highly intelligent when it comes to foraging for food. They are capable of remembering where food is located and when a particular fruit is ripe. They will also coordinate their efforts and share the meat amongst the group. 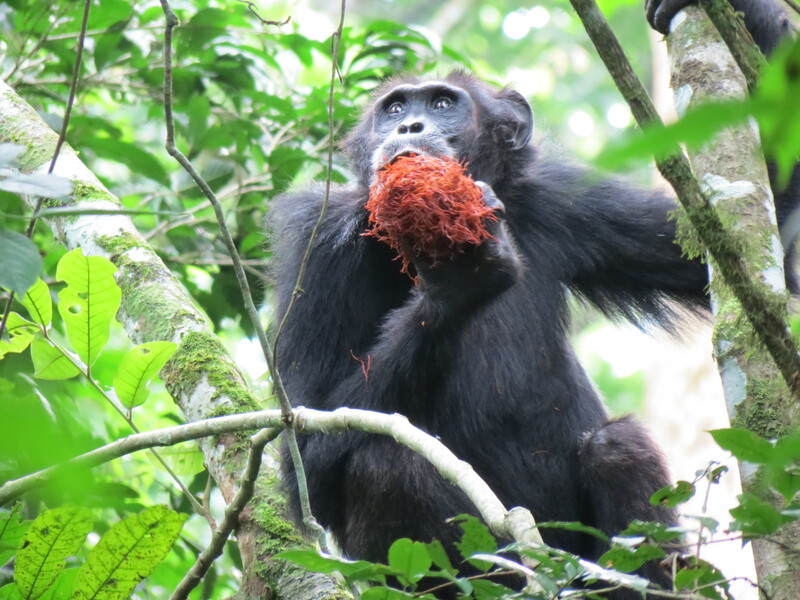 It has also been observed that some chimpanzees may consume certain plants for medicinal purposes, like soothing an upset stomach or getting rid of intestinal parasites. 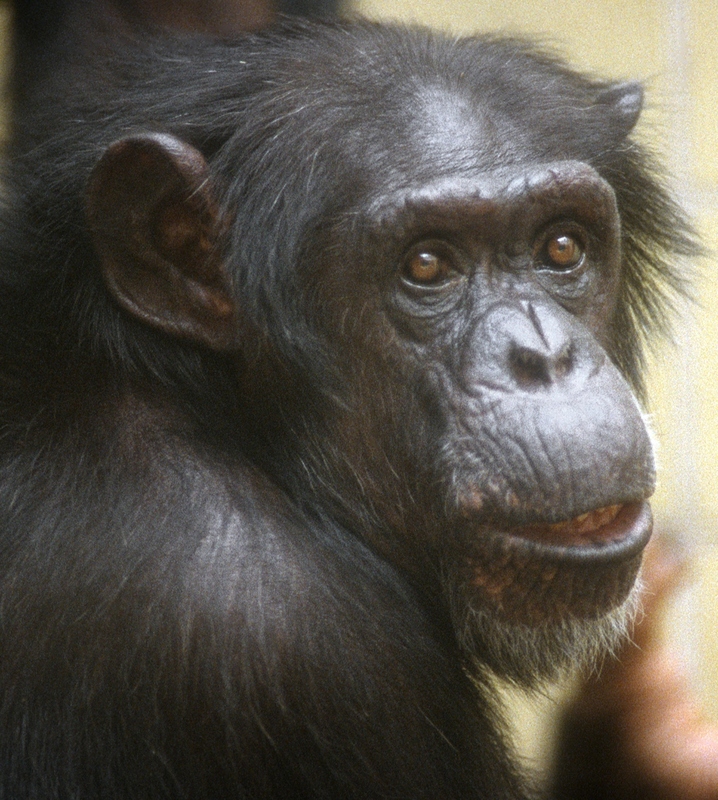 Chimpanzees are among the most threatened primates in Africa for many reasons (Goodall 2001). Fifty years ago, one million chimps were living in Africa. Today, it’s estimated that number has decreased to 170,000-300,000 wild chimps. 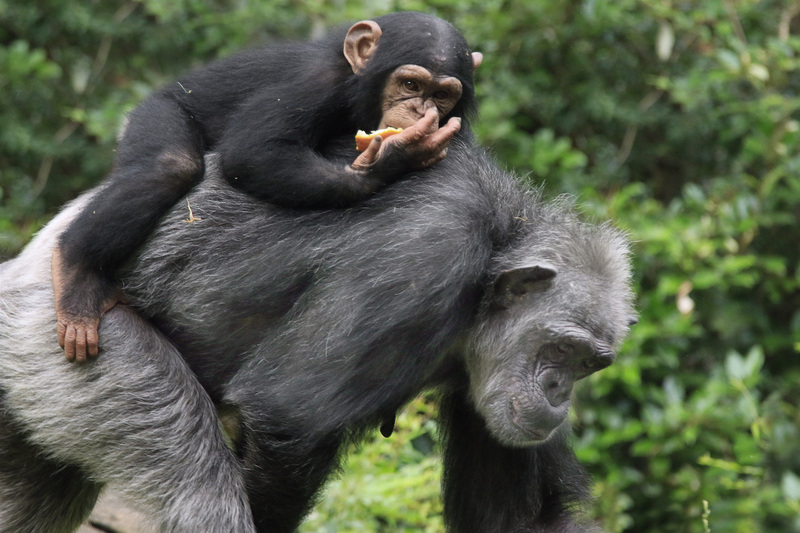 The Ivory Coast revealed that chimp population had decreased 90% in the last 20 years. Chimpanzees are listed as “Endangered” according to the IUCN Red List. 250 individuals are cared for in zoos throughout the United States. Habitat Destruction, hunting and disease are some of the primary threats to chimpanzees. 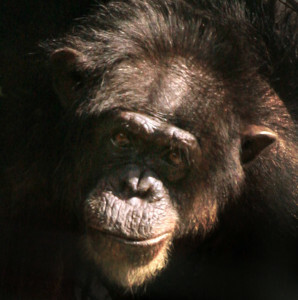 Ultimately the major risk to chimpanzees and their habitats is human encroachment. Female Ramona grooms male Mookie. 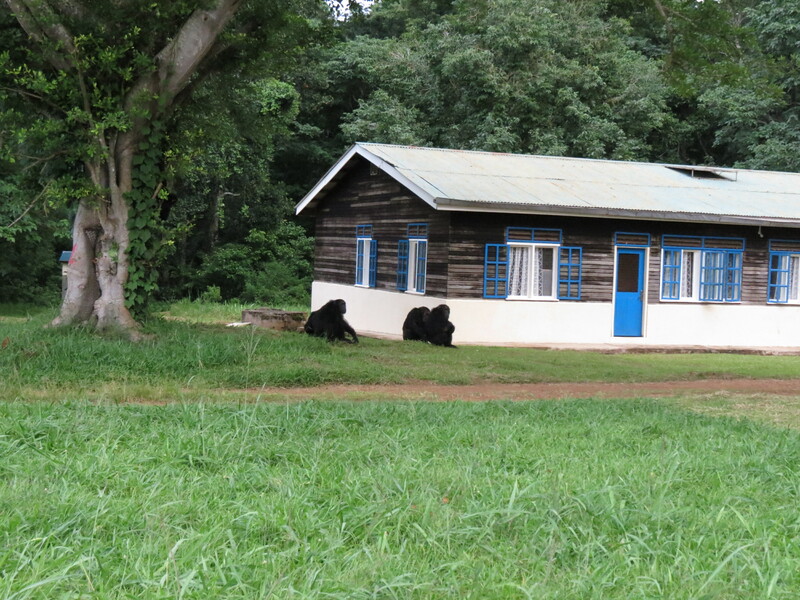 Jane Goodall Institute’s Tchimpounga sanctuary has taken in hundreds of rescued, confiscated chimps since it was founded and provides them with lifetime care. 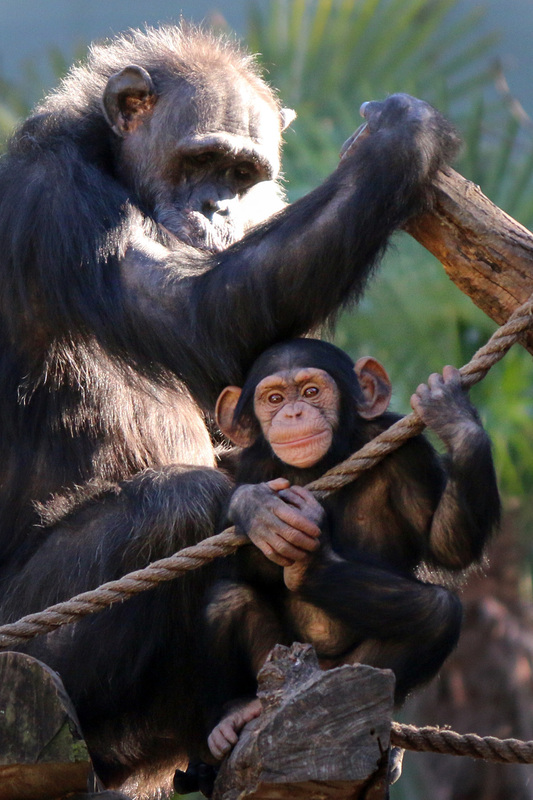 During our Swing Break event, the Dallas Zoo is partnering with The Jane Goodall Institute to raise much-needed funds to feed and care for two rescued chimps. Choosing sustainable forest products, recycle (especially cell phones), help stop the bushmeat trade, and support local farming are all major ways you can help protect chimps and their habitat. Educating those around you about environmental issues and promoting conservation are simple yet effective actions you can take, too. Goodall strongly believes that it is our responsibility as humans to speak up for those who cannot speak for themselves. A group of Dallas Zoo interns, including myself, have organized a jammed-packed week full of fun events and conservation engagement. We hope you join us at the Dallas Zoo during SWING BREAK through March 18 to help us create a better world for animals. Please support our efforts of raising funds for chimpanzees and the Jane Goodall Institute, so we can continue making a positive impact for the lives of great apes! Lower Wilds of Africa zookeeper Cristina Powers guest-blogs on ZooHoo! Working with animals in zoos is not nearly as glamorous as you might think. Our days are not filled with baby animals crawling all over us; instead a lot of our time is actually spent cleaning up after them, among other not-so-clean tasks. Something visitors may not know is how zookeepers develop very special relationships with the animals we work with. Our primates have amazing and unique personalities, making every day I work here different than the one before. Some of our chimps are very playful with us and it doesn’t involve any physical contact. As a protected contact, AZA-accredited zoo, we don’t share the same space with some of our animals, including great apes. In the mornings, our 26-year-old male chimp, Mookie, loves to engage us in a play session. He’ll look at me, bob his head up and down while bouncing his body, and he’ll run fast through his indoor rooms. I’ll chase him from the hallway and when he gets to the end, he’ll turn around and run the opposite direction. 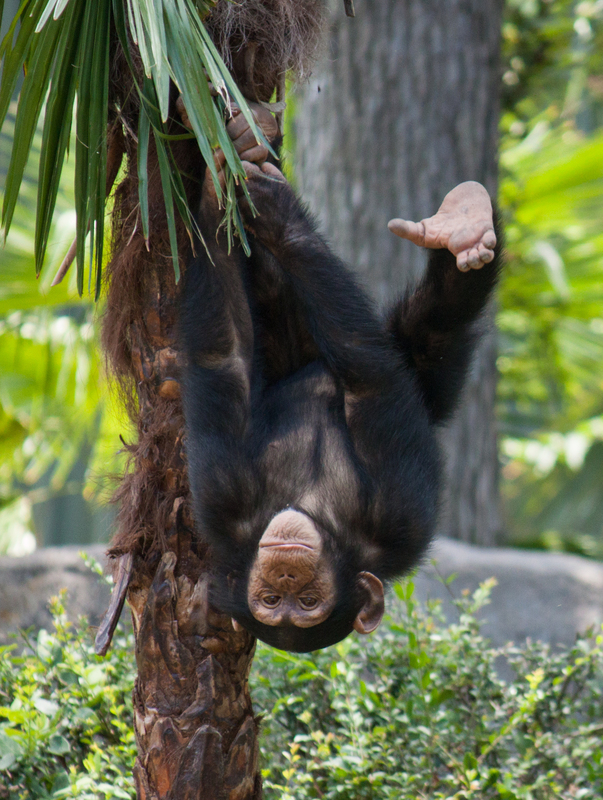 Chimp Mookie is known for his playful antics with keepers. Mookie will do this many times, then stop, signaling play time is over. Or I’ll just get tired and can’t do it any longer! With 7-year-old chimp Kona, it’s a little different. I’ll start running along the hallway and he might decide to join in the fun. Even little Mshindi has started to catch on. These animals are truly special to the people who work with them day in and day out. If they get sick, we worry. If we go on vacation, we miss them. When they move to another zoo, we are sent with them for a few days to help them adjust, and minimize stress after the move. When keepers leave the zoo, it is certainly not the end of caring and wanting to know more about our animals’ lives. We’ll email their new keepers and ask for updates and pictures. Keepers and volunteers will even arrange personal trips to go see an animal at their new home. And you can bet they’re both happy to see each other. A lot is said about an elephant’s memory, but don’t underestimate a primate’s. They can act very excited when a retired keeper comes to see them, or even someone they haven’t seen in a while. They’ll greet their old human friends with happy vocalizations; they’ll try to reach for them and sometimes won’t leave until the person is gone. When chimps are happy they might show it in different ways, such as opening their mouths really big, making panting vocalizations, and bobbing their heads. 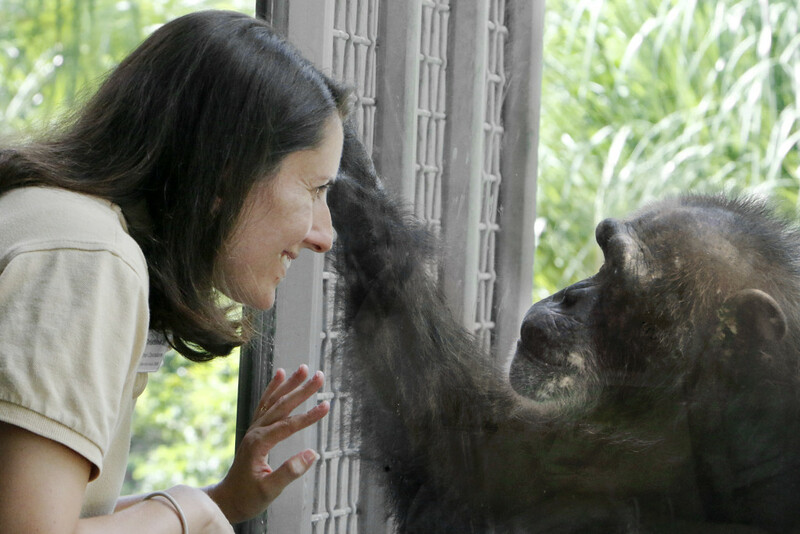 Keeper Cristina Powers shares a moment with chimp Missy. Being a zookeeper means sometimes we spend even more time around our animals and co-workers than our own families. During ice and snow storms, when the whole city (including the Zoo!) is shut down for business, we still have to spend many hours driving so we can get here to feed and clean their living quarters. If there’s still snow on the ground the next day, we do it all over again. Same for holidays. Even though the zoo is closed to the public on Christmas Day, our animals still need to be cared for just the same. So we make sure to have enough staff around to get the job done. Although not a common occurrence, if severe illness strikes in our animals, or one is still recovering from anesthesia or new situations arise, you bet we will be here overnight, taking turns keeping a watchful eye over them. Unfortunately, there comes a time when we have to say goodbye forever. The death of a beloved animal is very hard on us. If time allows, the keepers at home on their days off are called in to say their final goodbye. Tears flow freely. Calls are made and texts are sent to the ones who no longer work at the zoo. People from other departments, volunteers, old co-workers might send cards, emails, flowers, food – they know we are grieving. We miss them, we remember them, and we bring them up in conversations often. Even new keepers get to know so much about them, because we can’t stop talking about how special they were for years and years to come. I hope this gives a small glimpse of how special these animals are to us. This is dedicated to all zookeepers and their endless love for animals. Happy National Zookeeper Week, friends. Mshindi celebrated his 2nd birthday Jan. 26. Lower Wilds of Africa assistant supervisor Tami Jochem guest blogs on ZooHoo! Our youngest member of the Dallas Zoo chimp troop is 2! The birthday boy, Mshindi, lives with his mom, Ramona; dad and alpha male, KC; 6-year-old brother Kona; and five other members of the troop. At 2, Mshindi is becoming increasingly independent, but will stick close to mom for several more years. 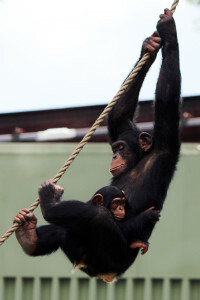 All of the individuals in the troop look out for Mshindi, and he often can be seen playing with or being carried by Kona, his aunt Koko, or the largest male in the group, Mookie. Mshindi will remain close to mom Ramona for the next few years. Mshindi’s favorite activity is to play and wrestle with the big boys. He laughs as they roll and tug him around, roughhousing like human kids do. The larger chimps are careful not to be too rough, adjusting their tremendous strength to his little body. And if anyone gets a bit too rough, one of the females will correct them – by coughing! Mshindi only needs to make one tiny noise if he feels he needs rescuing, and mom or another troop member immediately will grab him up and comfort him by holding, hugging, or patting him on the back. Six-year-old big brother Kona loves giving Mshindi rides. He enjoys exploring his habitat and is learning how to climb, swing, find food, and socialize. Baby chimps are born able to cling using both hands and feet. As they get older, they switch from riding on mom’s belly to her back. All infants have a white tuft of hair on their rumps, signaling their youngster status. By age 4 or 5, this tuft disappears and they begin to learn and act like adolescents. 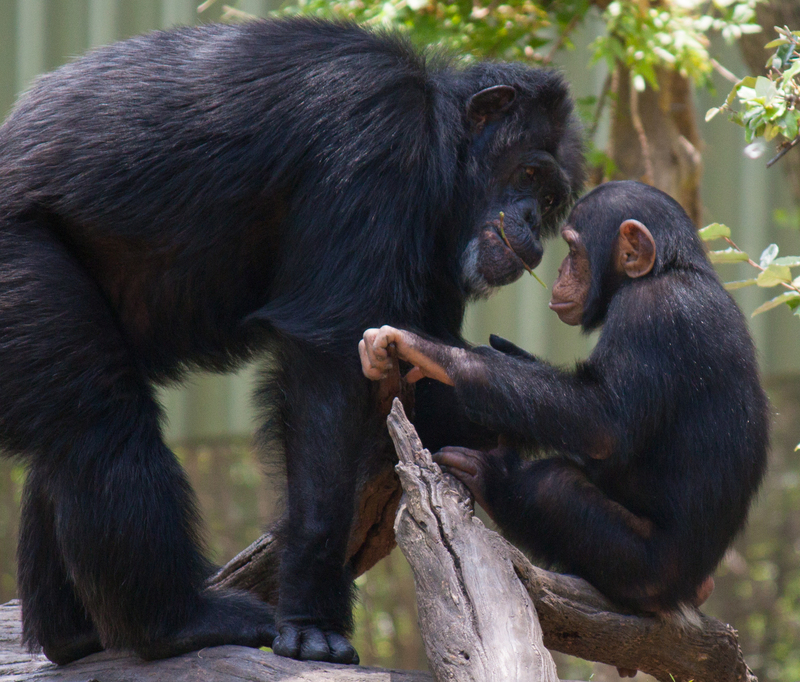 Chimps’ social structure is quite complex, and it takes many years to learn all its intricacies.